The Marketplace is a featured page within our platform. This portal offers our subscribing users a chance to access wholesale marketing and advertising services with just a few clicks. 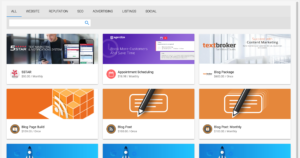 BluHorn has partnered with providers in fields spanning from graphic design and video production, to search engine optimization and social media, and everything in between. The Marketplace is designed to be a one-stop-shop to access advertising and marketing services that you and your agency or business typically outsource. It’s easy to get started outsourcing work through the BluHorn Marketplace, without even leaving your desk! The robust list of features and services is accessible in your BluHorn platform 24 hours a day. 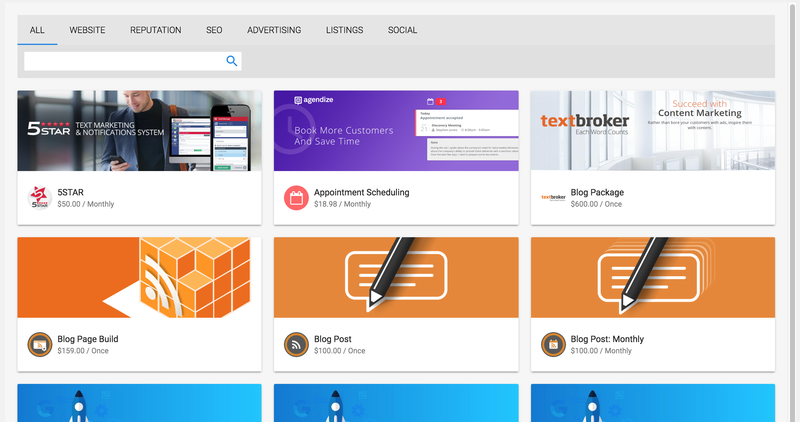 Simply click on the dashboard banners – or click “Marketplace” in the left hand menu. The shopping cart you see lists items in alphabetical order as you scroll. There are filter selections and a search bar at the top of the page to help you find what you need at any time. However, we recommend you scroll through the list a few times to get to know all that is available. Hovering over an item will populate a quick description of the product. If you’re interested in learning more, simply click anywhere in the box. The products and services each have descriptions, FAQs and even files or videos to help you determine if it’s right for you or your client. Pages are designed to provide all the information you need to make your decision. This info includes pricing information, anticipated timelines, sample creative images and reports, image galleries and occasionally videos to help make your decision-making process a breeze. Let’s examine a sample product, our “Videobolt: Your Company” product. This is a professionally produced one minute video to introduce a company on a website or social media. The top of the page shows the category of the product. In this case, it falls in “Content and Experience”. The pricing information is also included in the header ($315). Pricing will always disclose billing format. For example, this product is a “One Time” fee. If you choose a monthly product you will see the fees detailed clearly, as well as any policies or added fees if applicable. 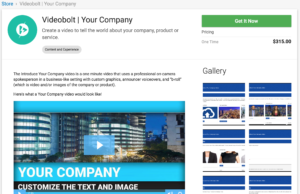 The first section is a brief introduction of the product, and this Videobolt product includes a video front and center as well. Scrolling down provides you access to quick facts about the product and the industry in general (in this case, video statistics). 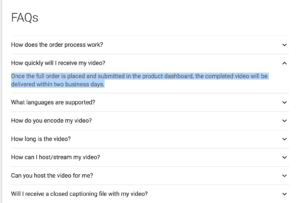 The facts are followed by FAQs on the Videobolt product. 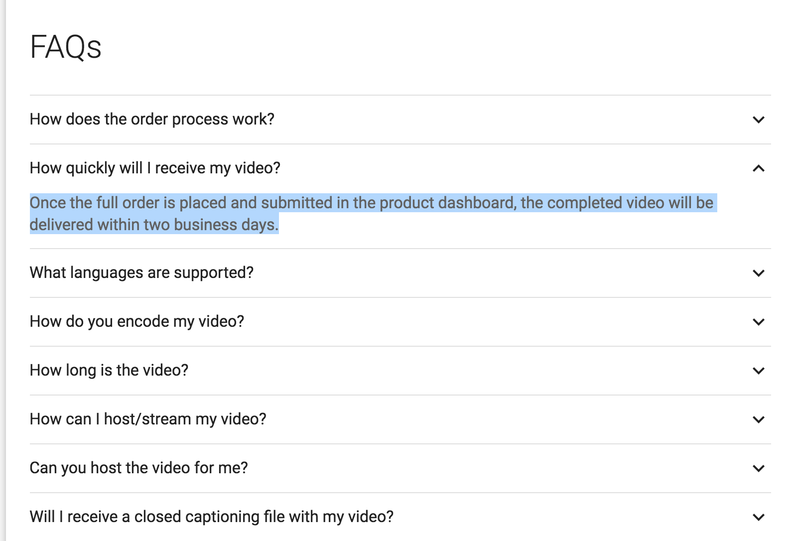 Dropping the arrow down after the “How quickly will I receive my video?” question reveals that once all details are received, the video is delivered in two business days. Scroll back to the top of the product page to access the gallery for the product. This includes screenshots of the Videobolt site, where submissions of information are made. This allows you to see firsthand what your process will look like. The finished product example video was included front and center on the page as well! This organization and order of product information, with facts, FAQs and gallery are mimicked on every product or service in our Marketplace. This makes it easy to quickly find the information you’re looking for, no matter which product you choose. If you’re ready to move forward, click the button at the top or bottom of the product page reading “Get It Now”. A pop up window will appear. You simply need to enter your name and company information. Note here: you’ll need to have a business name recognized by Google, which populates in the Company field. If you don’t see your company pop up, please reach out to us at the email address on the bottom of the screen. The form submission or email you send will trigger our team to contact you to get the necessary information required to move forward with your product order. This includes contact information, relevant questions for timeline and other product-specific details needed for our fulfillment team. Following payment, any software subscription products are available immediately. If it’s a design or development project, our marketing services team will reach out to your provided contact person within two business days to get the ball rolling. Once you’ve ordered your first product, you will be provided with a custom “Business Center” page. This page will be specific to your agency or business. Here you can manage all your subscriptions and access points. You can also order further products and services directly from this center. It’s a hub that can act as your business’s own marketing team! The BluHorn Marketplace is here to help you succeed! We make it easy to access wholesale services and products, which allows your agency to act as a full service marketing company, without adding a single staff member or freelance provider! 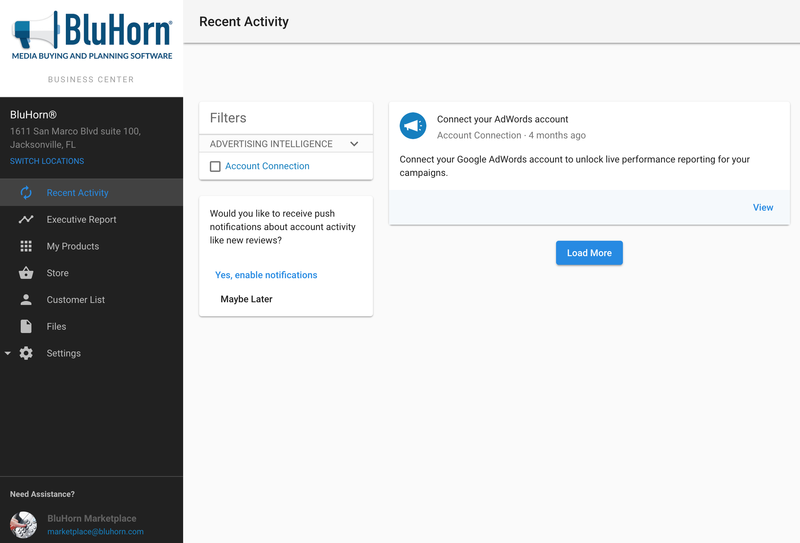 Visit our Marketplace through your BluHorn dashboard. 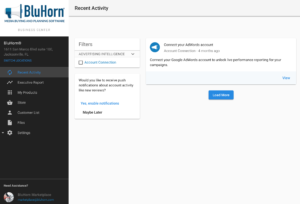 Or contact BluHorn to see how you can get access to the system. Start expanding your services, and increasing your business today!